On First Take Fridays a number of authors around Meeple Mountain give short first takes on games that are new to us. This week we have takes on Fleet Dice Game, Gùgōng, and Brikks. The duo of Matt Riddle and Ben Pinchback consistently turn out some of the most interesting and creative games in the hobby. Their card game Fleet is a strategic card game about manning a fishing fleet, managing licenses and boats, and making sure you catch as much fish as you can. When I heard they were converting it to a dice game I’ll admit that I was skeptical. There’s actual theme in Fleet, and the mechanisms felt like they’d be tough to translate into a dice game. But I’m here to tell you that they succeeded, and with flying colors. 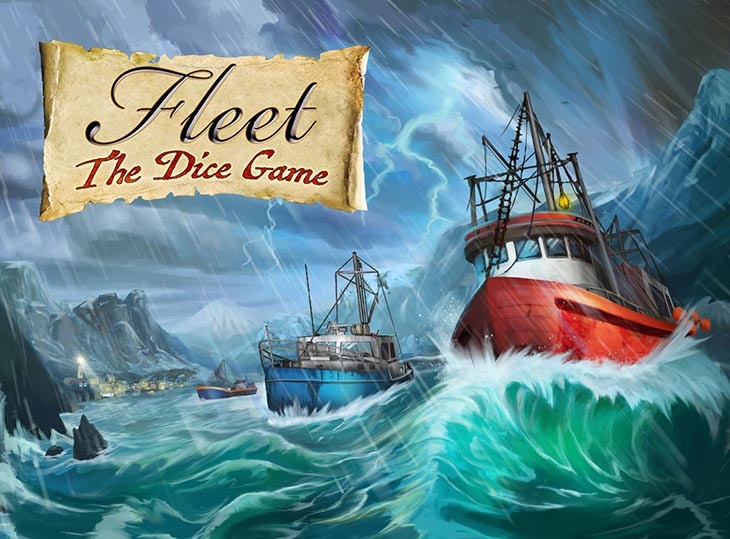 Fleet Dice Game takes place over 10 rounds, each of which play pretty quickly. Players perform the boating phase in which they roll dice and select which sea creature they want to fish that round (shrimp, cod, lobster, swordfish, or oyster). One player rolls, and in turn order each player selects one die from the pool, with all players sharing the remaining die. In the income phase, players add up the money they’ve earned thus far on their outing. As you check off areas in the income section of the scoring sheet, chances for bonus turns will reveal themselves. Next a fishing phase in which each player adds a check next to each launched boat. Finally players perform the town phase where they can perform various additional actions such as sell fish to the market, increase their income, apply for King Crab licenses, and more. Fleet Dice Game has a meaty, double sided scoring sheet that is dense with options. Other than some confusion with the way income works, the game plays very smoothly and provides lots of choices for different strategies. Fans of Ganz schön clever will likely enjoy this, and people who didn’t like Ganz schon clever because of its lack of theme might also want to give Fleet Dice Game a try. I think you won’t be disappointed. Gùgōng takes place in China during the construction of the Great Wall of China. The players take on the roles of powerful families trying to gain power and notoriety in the hopes of eventually gaining an audience with the Emperor. This is accomplished through the exchange of gifts with the Officials in the various locations around the board. Each player begins the game with a hand full of cards. Each of these cards has a numeric value and most include a depiction of a special action that the card can be used for. The game board is comprised of seven different locations and each of these is seeded with a card at the beginning of the game. On their turn, the player will select one of these locations and then trade a card from their hand for the card in that location. If the card they put down has a higher value than the one they picked up from the location, then they can perform the action on the card and the action associated with the location. If the card placed was of an equal or lower value, then they must either forfeit the action(s) entirely or they must utilize servants from their servant pool in order to perform the action(s). The different actions will allow the player to gain more servants, earn in-game victory points, unlock special abilities, as well as move closer to the throne room. If a player does not make it into the throne room by the end of the game, then they will automatically lose. This is a very high level overview of how Gùgōng is played, of course. While it might sound confusing at first, once the game gets going, it doesn’t take very long for things to start to click. I was surprised by Gùgōng. For starters, I purchased the Deluxe Edition of the game and it is probably the most gorgeous, well-produced game that I have ever seen. The tiles have all been replaced by wooden components. The plastic gems have been replaced by glass beads. Even the start player piece has been replaced by a beautiful metal coin. All this and the game also comes with a custom storage solution from Game Trayz. The second thing that surprised me was how rapidly the game plays at two players. 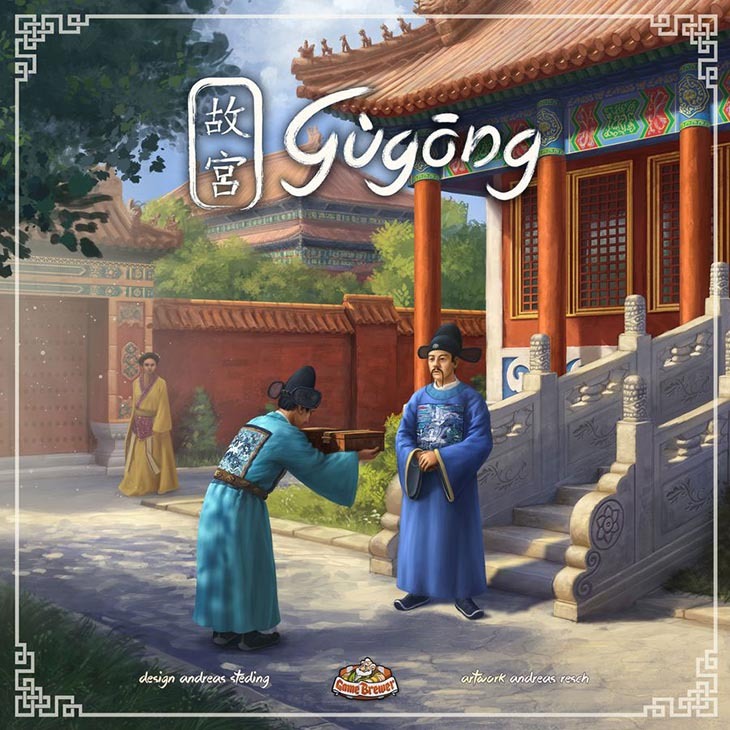 After reading the rule book and looking at all of the different components, I expected Gùgōng to be an hours long slog. Instead, each game took maybe 45 minutes each. Because of that, my wife and I were able to easily play two games back-to-back and we really enjoyed ourselves both times. I look forward to getting to play at a higher player count in the future. I anticipate this will greatly lengthen the play time. 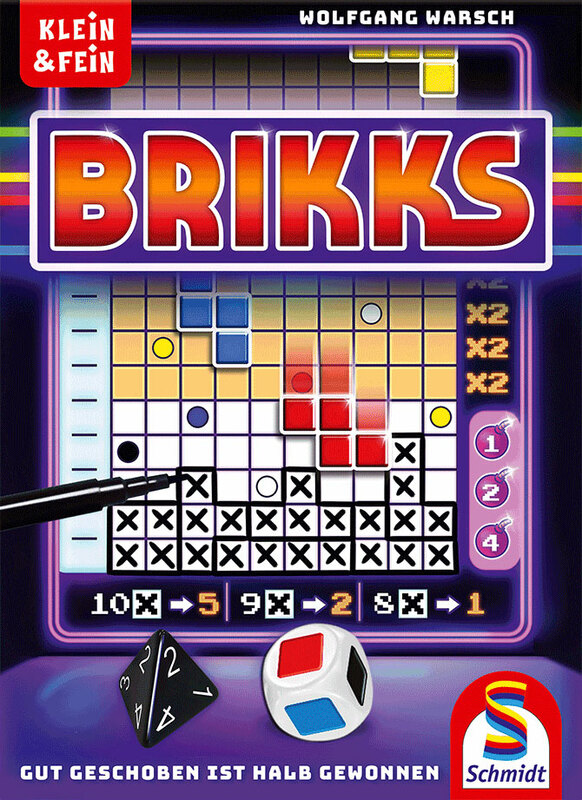 Brikks: a roll-and-write Tetris/polyomino-themed game by Wolfgang Warsch. Could a board game description possibly include more things I love? I was sold when I heard Brikks was a Warsch roll-and-write so the Tetris theme was the cream cheese icing on an already delicious carrot cake. If you recently slipped on a patch of ice, bonked your head, and forgot who Wolfgang Warsch is, let me remind you: he’s the designer who exploded onto the board game scene this year with 1 Spiel and 2 Kennerspiel des Jahres nominations for his games The Mind, Ganz Schön Clever, and The Quacks of Quedlinburg (which went on to win the Kennerspiel prize). So it’s safe to assume a game by Warsch will be really good. Of all the Tetris roll-and-write games released at Essen this year, Brikks is my standout since it’s the most like the video game. Each round in Brikks, the active player will roll two dice: one is a D6 with a colour on each side and the other is a D4 with the numbers 1 to 4. All the shapes and their possible rotations are shown on the back of the score sheet which is divided into 4 columns. The number on the rolled D4 will indicate which column players will use and the colour on the D6 indicates the shape for the round. Each player will then slide this shape, Tetris-style, into the grid on their score sheets and draw it. What sets Brikks apart from the other Tetris-like games are the combos a player can trigger (not surprising since it’s by Warsch). Players want to fill in a complete line with no empty spaces to score many points. But, if you wait and try to complete more than one line in a single turn, you’ll score even more points (up to 75 if you’re really good). Similar to Ganz Schön Clever, Brikks plays so smoothly and quickly that it has become my newest obsession. For me, Wolfgang Warsch’s name on a roll-and-write is like hitting the board game jackpot. Mr. Matthews your post is too good. but I think you should try to play with chaos dice set once. Definitely you will like this. Anthony, we don’t have chaos dice, plus the link you provided appears to be just 3d renders. Care to send us a set?